G. Wilson Knight was a mid-century critic probably most known for an infamous little essay on Hamlet he wrote in 1930 called “The Embassy of Death” (collected in The Wheel of Fire). The essay is sort of a troll. He argues that but for Hamlet himself, Denmark is a happy, lively place under the wise, gentle rule of Claudius. But for Hamlet’s mad injection of himself into the proceedings, which destroys most of the characters and the state itself, things would have been fine. Hamlet is the sick, deranged soul who drags down a healthy world. Claudius, as he appears in the play, is not a criminal. He is—strange as it may seem—a good and gentle king, enmeshed by the chain of causality linking him with his crime. And this chain he might, perhaps, have broken except for Hamlet, and all would have been well. Now, granted the presence of Hamlet—which Claudius at ﬁrst genuinely desired, persuading him not to return to Wittenberg as he wished—and granted the fact of his original crime which cannot now be altered, Claudius can hardly be blamed for his later actions. They are forced on him. As King, he could scarcely beexpected to do otherwise. Hamlet is a danger to the state, even apart from his knowledge of Claudius’ guilt. He is an inhuman—orsuperhuman—presence, whose consciousness—somewhat like Dostoievsky’s Stavrogin—is centred on death. Like Stavrogin, he is feared by those around him. They are always trying in vain to ﬁnd out what iswrong with him. They cannot understand him. He is a creature of another world. As King of Denmark he would have been a thousand times more dangerous than Claudius. I have concentrated on Claudius’ virtues. They are manifest. So are his faults—his original crime, his skill in the less admirable kind of policy, treachery, and intrigue. But I would point clearly that, in the movement of the play, his faults are forced on him, and he is distinguished by creative and wise action, a sense of purpose, benevolence, a faith in himself and those around him, by love of his Queen…In short he is very human. Now these are the very qualities Hamlet lacks. Hamlet is inhuman. He has seen through humanity…. He has seen the truth, not alone of Denmark, but of humanity, of the universe: and the truth is evil. Thus Hamlet is an element of evil in the state of Denmark. The poison of his mental existence spreads outwards among things of ﬂesh and blood, like acid eating into metal.They are helpless before his very inactivity and fall one after the other, like victims of an infectious disease. They are strong with the strengthof health—but the demon of Hamlet’s mind is a stronger thing than they. Futilely they try to get him out of their country; anything to get rid of him, he is not safe. But he goes with a cynical smile, and is no sooner gone than he is back again in their midst, meditating in grave-yards, at home with death. Not till it has slain all, is the demon that grips Hamlet satisﬁed. And last it slays Hamlet himself. I really like the essay as a performance, since it does (if you’re not completely alienated by it) make you realize how equally unlikely the contrary and common interpretation is, with Hamlet the good guy and Claudius the fount of evil. But Wilson Knight evidently saw that if he was going to make a critical impact, there was no point in being restrained. He might as well push his own account to the limit, even if it completely broke with plausibility. Outrage trumps reasonableness and moderation. On the right we have personal qualities; on the left, social and political. In the centre is a creative ‘conflict’ (not exactly ‘disorder’) related to the clash of individual and society. This conflict is nevertheless mainly inward and spiritual, and most fully experienced within the protagonist. It next tends, like a cyclone or hurricane, to move down the chart, developing into ‘armed opposition’, with the area columns showing a strong divergence of personal and communal symbolism as the rift widens; and so on to a tragic resolution. 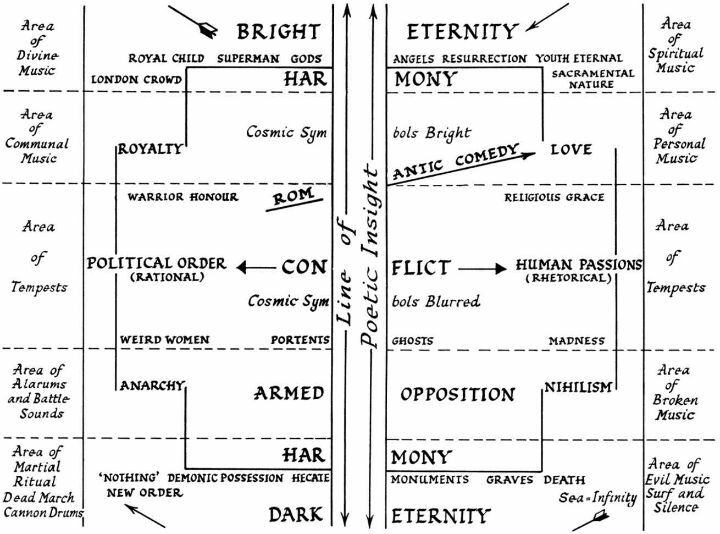 But our chart should at least serve to indicate the danger of saddling Shakespeare’s world with any static scheme whatsoever. Only when these various powers are recognized shall we understand the true process of harmonization at work. And then I think that James Joyce really did achieve as close of a merging of the two as was possible, by taking a million schemas and attempting to superimpose them over one another simultaneously in his last two novels. And Wilson Knight’s choice of anchoring motifs–music and tempests–are pretty good ones. A fair amount of Bardolatrous criticism might be described as attempting to turn Shakespeare into Dante by treating a bunch of hit plays and some flashy poems as a single structure, “a poem of a life.” Auterist treatments of popular culture drop into similar patterns. I’m not sure where this drive comes from. This drive, Mr. Davis, for systematization, would be scientific in nature. Mr. Auerbach, I endorse your notion to this science and love your unification of Joyce, Dante, and Shakespeare, who unknowingly or not, are forever their own contemporaries, extemporally, if you will. Furthermore, on a personal level, I found the subject matter and relation made of literary personalities to be hipster, yet the lack of comments on the blog seem to counter that interpretation, for hipsters are culturally subversive and are often associated to Joyce and Shakespeare “readings”, in that, they enjoy holding their names on bindings in the public eye. Only today discovering your blog, I have yet to comprehend your icon of Dante, though you have here hashed a new literary relation of him to the rest of his caste. After having seen the ex post facto on Ulysses, I was influenced as a writer, poetically, to scheme about my own writings, if only as an overlay to the product. In the same sense, reading the waggish.org posts on Finnegans Wake, I now choose to read the ultimate Joyce while ignoring all other literary tasks and research, because of his evident influence over me. G. Wilson Knight was weird as all get out. Near e end of his life I saw him Give a lecture-demonstration of Timon’s soliloquys, where he ended up stark naked, on the verge of the salt flood, in cobalt blue body-paint, his four-score and upwards shanks and sunken chest turning Timon into a Beckett character. He was a believer in spirit mediums, and one of the greatest of Shakespearians. J: I think this may explain your reaction: http://dustinland.com/archives/archives464.html — the term may move around, but everyone always wishes to be king of whatever their personal paper empire is. Nightspore: Really? I figured he was weird, but didn’t think he was the Genesis P-orridge of literary criticism. Timon is a good choice for that. I suspect my comment sprung forth during one of those moments when it suddenly seems inconceivably odd that one would be surrounded by creatures who breathe and ingest through a single aperture. That cartoon is pretty spot-on. I will say, though–and this may just be my personal animosities coming through–that a hipster is the last thing I think of as culturally subversive.